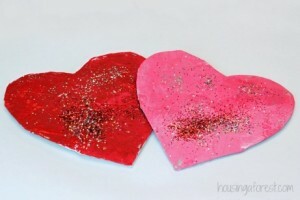 Valentine’s Day with a toddler is a perfect excuse to make some super cute craft! You’ll find no expensive roses here, just very simple, super fun craft and cooking activities for toddlers. We’ve sourced some of the best Valentine’s Day toddler activities to put together our list of 10 Great Valentine’s Day Toddler Activities. Let’s face it – receiving these gifts on Valentine’s Day definitely beats a store bought card and some flowers (although chocolates are always appreciated!). There is also a chance to win US$500 cash (open worldwide). Enter at the end of this post. 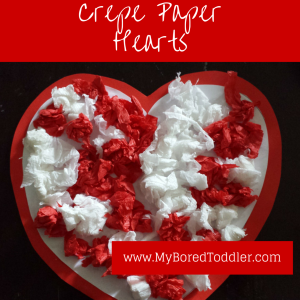 Ripping and scrunching crepe or tissue paper are excellent fine motor activities. 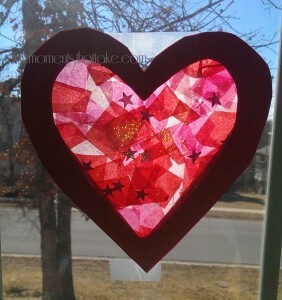 They also form part of this fun and easy Valentine’s Day crepe paper heart. Toddlers will have lots of fun with this craft activity. You can read the instructions here. This beautiful sun catcher from ‘Moments That Take My Breath Away’ looks fantastic and is surprisingly easy for toddlers to make. Using simple materials, and a bit of glitter for that extra sparkle, your toddler will love making and displaying these heart shaped sun catchers. Find out more about this activity here. What I love most about this simple craft activity from ‘Housing a Forest’ is that it is so easy, yet so much fun for toddlers. 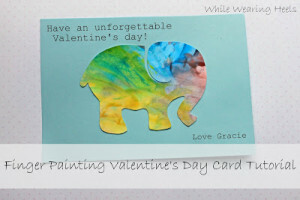 My toddlers tried this Valentine’s Day activity and they really enjoyed it. You can write on the back and give them as cards too! Read more about this toddler craft activity, including a full tutorial here. If you have more broken crayons than you know what to do with (and let’s face it – who doesn’t!) 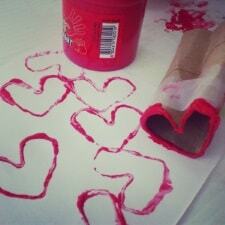 then you will love this next Valentine’s Day activity for toddlers. ‘Time 2 Save Workshops’ has shared with us how they use old crayons and turn them into new and exciting heart shapes. 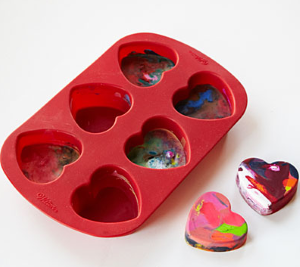 Any toddler will love drawing with these on Valentine’s Day. Find the instructions here. 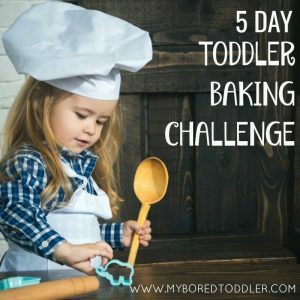 If your toddler is past the stage of putting everything they touch in their mouth, and they love to get MESSY, then this is the activity for them. 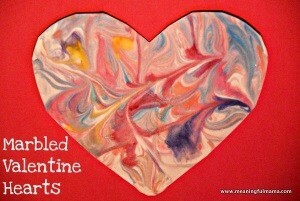 This marbled valentine heart activity from ‘Meaningful Mama’ looks amazing and is a lot of fun to do. It’s also easier than it looks! Find out how here. You wouldn’t normally link toilet rolls and Valentine’s Day together, but this simple toddler craft from ‘Lazy Moms Blog’ looks really effective, and is a great way to use up all the empty toilet rolls. You can get the full instructions here. I have to admit to being a Mum that prefers to give her kids healthy treats (most of the time… not always!) 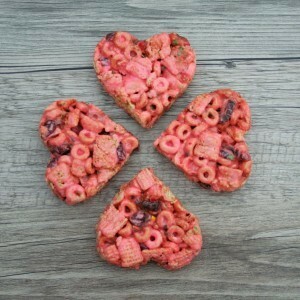 which is why these Pink Heart Cereal Bars from ‘Fit Mama 4 Life‘ are so great. 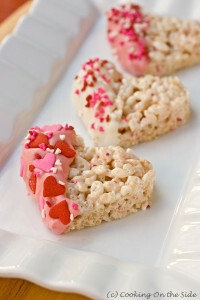 They look amazing, are simple to make and are an excellent healthy treat for toddlers. You can find the full recipe here. People won’t believe these cards from ‘While Wearing Heels’ were made by your toddler – they look so amazing! Definitely better than a store bought card. Despite looking complicated they are actually really easy to make and you can find the full tutorial here. Toddlers and Playdough are so well matched. It has to be up there as one of the most popular toddler activities. 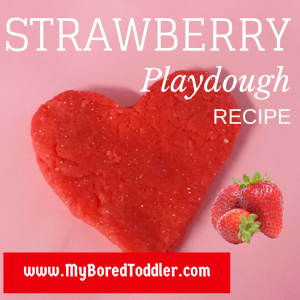 Just when you didn’t think playdough could get any better we made it strawberry scented, just in time for Valentine’s Day. This makes a great sensory play activity. You can find the full (easy) recipe here. If you want even more activities you toddler’s may enjoy our Snowman Crafts or our Toddler Boredom Busters. Congratulations to the winner of the US$500 Cash giveaway, Shelly Martinez. Thank you to everyone who entered. Some lush ideas there! The toilet roll has been on my agenda since LAST valentines, seriously I need to get a move on with that – it’s not like there’s never any rolls in the house!! I love the stain glass idea too, my 8 year old would love it as much as my 2 year old! Love it! 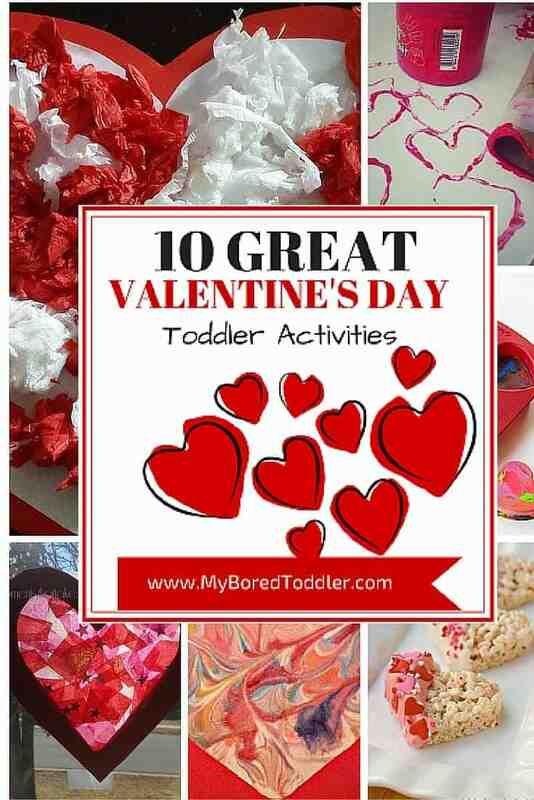 Great list and have pinned this on my personal Valentines board as well as the #ToddlerApprovedTuesday board. LOVE EVERYONE of these! And my 2 year old will too! Hope to get all of the supplies together for this in time!! Thank you for this! Hope for a better Valentines this year…last year my friend slipped and broke her arm on the dance floor. Great ideas, always a fantastic source of inspiration! I love how they are all so simple, great ideas foe me and my son, thank you!